Me neither... but if Gribbler hasn't played it, obviously it doesn't actually exist. Err... yeah yeah... This is OD's April Fools joke, obviously! He's just quick off the mark. I kind of wish I had played whatever game that is... having a "think" verb intrigues me. I feel like I missed an opportunity there. It's a SNES/Super Famicom game. 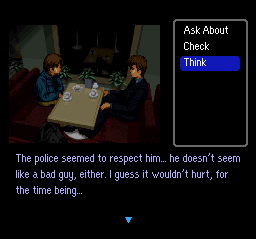 It was only released in Japan, but it got a fan translation several years later. It's a remake of a Famicom game. It's the 2nd part of a series of games, but is actually a prequel to the original game's story. Still don't know the game, but just like CaptainD is intrigued... I WANT a think verb in one of my games! I know next to nothing about old SNES games, I never had that console. 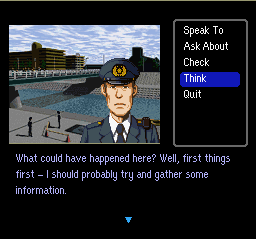 But using my extraordinary deductive skills (and your hints ) I think it's one of Famicom Tantei Club games. ...maybe? Any idea which one? 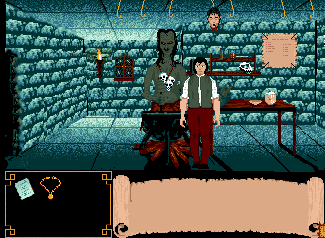 It's more of a visual novel than a standard puzzle solving adventure game, but I remember the story being really good. 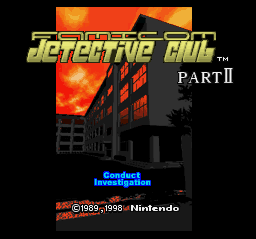 I'm not suggesting you go downloading ROMs and emulators, but if you were to find yourself with a ROM of the game and you happened to download the fan translation patch, place it in the same directory as the ROM and give it the same name, you might find yourself playing a fun detective game with a great story and a think verb. Or you could learn Japanese and buy the original cartridge, I guess. 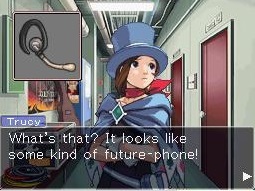 That's Apollo Justice, part of the Phoenix Wright series!